Monitoring phenology by recording the first bloom date of lilacs has involved Idahoans since the 1950s. Phenology is the study of life cycle events in relation to climate. For plants this could mean when leaves turn color in the fall, or when when pollen is released from grasses. Understanding phenology in Idaho can inform decisions of when to plant crops , or provide an understanding of the synchronization between plant and animal life cycle events [6,8]. Beginning in 1957, researchers at the Montana Agricultural Station in Bozeman Montana organized close to 1000 observers across the 11 western states to monitor lilacs as an indicator for agricultural applications . to climate [1,6,9,10]. A good example of this is the first leaf and first bloom dates of lilac plants, which track well with the year to year variations in spring temperatures [2,4,6,7,8]. Many research efforts have documented the connection between temperature and the timing of plant life cycle events [1,6,9,10]. For lilac bloom dates studies show that the average springtime temperature affects the date of when lilacs flowers emerge for a given year [2,4,7,8]. When average spring temperatures are colder than normal, lilacs bloom later in the year. When average spring temperatures are warmer than normal, lilacs bloom earlier in the year. 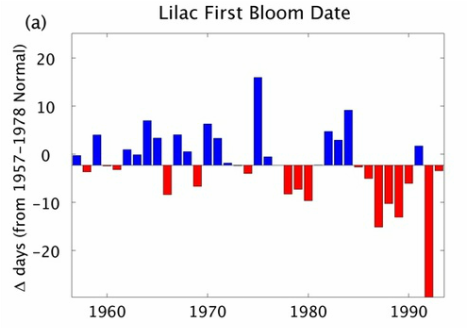 To see if springtime temperatures and lilac bloom dates are closely related in Idaho we used the North American First Leaf and First Bloom Data, initially from the NOAA/NGDc Paleoclimatology Program , and now housed by the USA National Phenology Network . This data was collected by citizen scientists across the state. To collect this data, citizen scientists selected a well-established common lilac that would persist in its present location of full sun and away from obstacles . Observers then recorded first bloom data, “The date when the first flower is fully open” . and sent this information back to the Montana Agricultural Experiment Station. For our analysis we selected a total of 13 monitoring locations that had at least 20 years of bloom records from 1957-1993. We then acquired statewide spring (March-May) temperature data  and plotted it against bloom anomalies (a change from normal) (Figure a). The results show within the state of Idaho, lilac (Syringa vulgaris) bloom date is highly influenced by average spring (March-May) temperatures, suggesting that lilac bloom dates are a valid indicator of statewide spring temperature. The statewide average bloom date of lilacs arrived 8.1 days earlier per decade between 1975 to 1993, with large variations between years. These results are similar with other lilac phenology studies across different parts of the United States [2,3,8]. Today, organizations like the USA National Phenology Network continue the phenology monitoring effort by enlisting citizen scientists across the nation to collect data, not only for lilacs, but all different kinds of plant and animal species. Data from these efforts are being used to understand how climate interacts with plants and animals over time. [2,4,7,8]. Betts A K. (2011) Vermont Climate Change Indicators. Weather Climate and Society, 3 106-115. Caprio J M (1966) Pattern of Plant Development in the Western United States. Montana State College, Agricultural Experiment Station, 607. Cayan D R, Kammerdiener S, Dettinger M, Caprio J, Peterson D (2001) Changes in the Onset of Spring in the Western United States. Bulletin of the American Meteorological Society, 82 399-415. Daly C, Nielson R, Phillips D (1994) A Statistical-Topographic Model for Mapping Climatological Precipitation over Mountainous Terrain. Journal of Applied Meteorology, 33 140-158. ​Schwartz M D (1998) Green-wave phenology. Nature, 394 839-840. Schwartz M D and B.E. Reiter (2000) Changes in North American spring International Journal of Climatology, 20 929-932. Schwartz M D, Ahas R, Aasa A (2006) Onset of spring starting earlier across the Northern Hemisphere. Global Change Biology, 12 343-351. Menzel A, Estrella N, Astrid T (2005) Temperature response rates from long-term phenological records. Climate Research, 30 21-28. Rosenzweig, C., G. Casassa, D.J. Karoly, A. Imeson, C. Liu, A. Menzel, S. Rawlins, T.L. Root, B. Seguin, P. Tryjanowski (2007) Assessment of observed changes and responses in natural and managed systems.Climate Change 2007: Impacts, Adaptation and Vulnerability. Contribution of Working Group II to the Fourth Assessment Report of the Intergovernmental Panel on Climate Change, M.L. Parry, O.F. Canziani, J.P. Palutikof, P.J. van der Linden and C.E. Hanson, Eds., Cambridge University Press, Cambridge, UK, 79-131. USA National Phenology Network (2010) Plant Phenology Data for the United States, 2009. Tucson, Arizona, USA: USA-NPN. Data set accessed YYYY-MM-DD at http://www.usanpn.org/results/data. Schwartz M and Caprio (2003) North American First Leaf and First Bloom Lilac Phenology Data, IGBP PAGES/World Data Center for Paleoclimatology Data Contribution Series #2003-078. NOAA/NGDc Paleoclimatology Program, Boulder CO, USA. White M A, Running SW, Thornton PE (1999) The impact of growing season length variability on carbon assimilation and evapotranspiration over 88 years in the eastern deciduous forest. International Journal of Biometerology, 42, 139-145.